Due to increased insulation in buildings, high solar heat gains and the use of heat generating equipment in offices such as computers, printers & photocopiers and the building position in relation to the sun, many buildings have the need for simultaneous heating & cooling throughout the year. 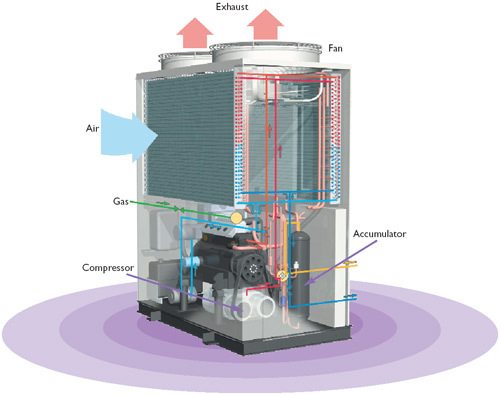 Modern Air Conditioning Systems can allow independent cooling and heating operation at the same time. 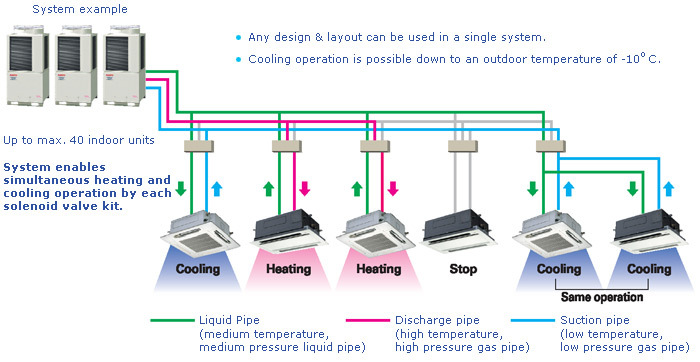 This type of system takes heat from areas that require cooling and uses this heat in other areas that require heating, enabling the system to maintain an optimum temperature throughout the building. As a result, a rduction in energy saving of up to 25% compared to conventional systems can be made. Over 10 internal unit styles to meet internal design requirements. Innovative, unique, economical, environmentally friendly and highly efficient: all words that describe the SANYO ECO G GHP gas powered range of VRF systems. The ideal solution where there is a shortage of electrical power.